As Director of the U.S. Task Force on National and Homeland Security, Dr. Peter Pry warns an electromagnetic pulse could fry the grid. In the following year, 90% of the population dies. What we can do. Then Elisabeth Rataj on mental health impacts of extreme weather in the developing world. This Radio Ecoshock show contains disturbing possibilities. It may not be suitable for small children or anyone already prone to fear or depression. Incredibly, a pulse of high energy radio waves can knock out everything electrical over a continent, or over the whole world, in nano-seconds, with no warning.It comes from an EMP – an electromagnetic pulse. The cause could be a small nuclear weapon detonated 300 kilometers up in space by a hostile power or terrorist group. We wouldn’t see it, hear it, or feel any health effects. The lights go out, communications stop, commerce stops, travel stops (airplanes would likely drop out of the sky, causing up to half a million deaths). Because most utilities have not protected their giant transformers, and there are no replacements, the grid would stay down for at least a year, or a decade, or forever. There are ways to protect the system, but a captured Washington regulation system has not pushed for these simple steps. A hostile power aside, our expert guest tells us an EMP hit is “inevitable” within the time of those living now, because the Sun can also crash our electrical systems world-wide. A large solar storm, big enough to do it, was seen in 1859. It’s called the Carrington Event. If part of the Sun blows our way, all satellites are knocked out. The wires of our electric system act like antennae, receiving the deadly pulse. We may expect global warming, or the next financial crash. But a very different disaster is also possible. It’s brewing, it’s becoming more likely, and it’s questionable whether the nation, or even this civilization could survive. 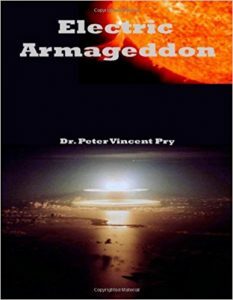 There will be no warning, except for what you are about to hear from Dr. Peter Pry. Dr. Pry’s resume goes back to the Cold War days of containing the Soviet Union. For ten years in the Central Intelligence Agency, he studied and reported on Soviet and Russian nuclear intentions. That included a weapon as devastating, perhaps more devastating, than an atomic bomb arriving in a major city. It’s called “Electromagnetic Pulse” or EMP. Dr. Pry has advised Congress in many roles, including, quote: “the Commission to Assess the Threat to the United States from Electromagnetic Pulse (EMP) Attack“. Currently he is the Executive Director of a congressional advisory body called the Task Force on National and Homeland Security. He’s also the director of the Nuclear Strategy Forum. After the three reactors at Fukushima, Japan blew up, I renewed my research into how fragile big power grids are. I was shocked to learn there are no standard replacements for transformers used by utility companies. If a lot blow, it could take years to replace them. Only two factories in the world make those custom transformers – both in Asia. They can only churn out a couple of hundred a year, and there are about two thousand in the United States alone. So that’s 5 years IF the U.S. gets the total production (when the whole world may want them). These things are as large as a house. There are only two trains in America able to carry them. It’s a giant operation – so why don’t we protect the ones we have? It can be done, at relatively low cost, likely less than $20 billion dollars, which is small change for the American budget. The usual techniques used by the military to “harden” electrical equipment needs to be installed – things like “Faraday cages” and surge protectors. Congress has now passed two Acts requiring the utilities to start protecting their systems, but little to nothing happens. There is no enforcement, because the agencies regulating the utilities have suffered “regulatory capture”. The big corporations which government agencies are supposed to oversee have in various ways bought off the Congress people, or installed representatives from the industry into these committees or agencies. A few other countries have begun to protect themselves, but America is wide-open to EMP attack. NORTH KOREA – ARE THEIR EMP’S ALREADY IN PLACE? You’ve been reading or watching the news about North Korea’s development of nuclear weapons and rockets. Dr. Pry tells us an incredible story (but it is credible). In 2004 the Russians did what they never do: they shared intelligence and a warning about technology transfer to North Korea. Apparently it was inadvertent – i.e. not planned by Putin and his government. When Russia experienced serious financial problems, and could not pay their top scientists, some were hired by North Korea in 2004. They took with them the knowledge of how to build and deploy electromagnetic pulse weapons. The U.S. was told it could only take about two more years to test a small weapon. Right on schedule, in 2006, North Korea tested it’s first nuclear weapon. The world scoffed a bit, because this nuclear explosion was quite small. But Dr. Pry says that is exactly the size needed for an EMP in space. It’s possible, he says, to stuff a small nuclear weapon into a satellite. North Korea has two satellites up already, and we don’t know what’s in them. They are on an orbit that comes over the South Pole toward the southern border of the United States. During the Cold War with the Soviet Union, all assumptions and missile defenses were planned for missiles coming over the North Pole. The Southern border is undefended in that sense. So it’s possible the North Koreans already have a small nuclear weapon in a satellite that can be blown off about 300 kilometers up in space. They may already have the capability to bring America to it’s knees, to send the U.S. back to Medieval times without electricity for a decade or more. Or the North Koreans may still be working on it, with their new rocket motors and new satellites going up. Surely that should send American utility companies, and the government that regulates them, scrambling to prevent such mega-damage to the grid. But don’t expect Donald Trump’s government to enforce those existing laws, or do anything about it. It’s a bit strange to me that various right-leaning publications, like World Net Daily and so on, are quite willing to publish articles about the EMP threat, but not about climate change. Peter Pry thinks the longer term risk of global warming is distracting the country from the real threat of EMP, which should come first. I disagree. We need to protect against both. You can read an article published by Peter and another article, in the Wall Street Journal, on the North Korean EMP threat here (without a subscription to the Journal). We know it’s real. In 1989 a big transformer owned by Hydro Quebec in Canada melted down with a fairly common sized solar storm. Another transformer at a New England nuclear power station also blew. The whole danger of exploding nuclear weapons in the upper atmosphere was discovered during a weapons test in the Pacific in 1962. The lights in Hawaii went out. See this Wikipedia entry on “Starfish Prime“. Recent solar studies show that the Sun can and will have a major eruption, called a “Coronal Mass Ejection“. Then all it takes is for that side of the Sun to be facing Earth for a wave of energy to head toward Earth. We would have a couple of days warning in such a case – but there’s no way to protect the electric grid in two or three days! There’s been several near misses in just the last five years. Like earthquakes, we know this will happen, we just don’t know when. NASA says the odds of an appearance of a Carrington Event are about 12% per decade. As each decade goes by without one, the odds rise. A massive solar storm, like the 1859 Carrington Event which burned down telegraph lines and went deep into the ocean to wreck the newly-laid Transatlantic Cable, would not just hit America. It will disable all electronics all over the world. You may have the illusion that developing countries will survive well, because they have more people already off-grid, like the 600 million people in India without electric power. But Peter Pry and his Committee have looked into this. It turns out even the developing world countries are already so dependent on the international system, they too will suffer massive population losses. Think fertilizers and pesticides that are feeding them. There are multiple dependencies on functioning Western economies that will fail. By the way, about a week after the grid goes down, for any reason, every nuclear power plant goes melts down like the three at Fukushima Japan, spewing radioactivity across the country and around the Northern Hemisphere. In a bleak way, a giant solar storm might save the disappearing species, and end our civilization-wide carbon emissions. It would also “solve” our population problem. But that’s a solution that is too horrible to contemplate. Dr. Pry does say that having more home power system off the grid, like solar or wind, increases our ability to survive. You can also act as a State or Province. Maine, Virginia, and Florida have already moved to harden their electric systems. Texas is working on it. It just took one very determined person in Maine to help protect that state. You can even harden your grid at a community level. Find a blueprint for action in Peter Pry’s latest book “Blackout Wars: State Initiatives To Achieve Preparedness Against An Electromagnetic Pulse (EMP) Catastrophe” published in late 2015. I read his earlier book “Electric Armageddon: Civil-Military Preparedness For An Electromagnetic Pulse Catastrophe”. Maybe the EMP issue, like climate change, is a kind of test to see if we are an intelligent species or not. We know what the threat is, and even how to solve or minimize it, but will we act? His web site is here. Here is another interesting web site on EMP preparedness, called “Secure The Grid“. Next we discover the rare: what are the mental health effects for all the people in the developing world who have been ravaged by typhoons, fires and other violent events related to climate change? It turns out kids are hit hardest, but people of all ages suffer from PTSD – as did Americans after Hurricane Katrina. Eventually, will humans become too weakened mentally by repeated extreme events, too weak to respond anymore? We explore what little we know with Elisabeth Rataj, the German-trained public health expert currently on assignment in Muslim Mindanao, the Philippines. Scientists agree that more extreme weather events will hit most of the Earth as the climate shifts. Studies of Americans after Hurricanes Katrina and Sandy showed increased and continuing mental health problems including Post Traumatic Stress Disorder. Some people in Japan are still fearful, their lives in tatters, six years after the major earthquake there. Is it possible each hit of climate change could leave the general population less able to deal with the next? But what about the impacts of extreme weather in developing countries, where studies are seldom done? Now we know more, thanks to research published in the journal BMC Public Health. Three authors combed through the records in South America and Asia following extreme weather events. Let’s see what they found. Our guest Elisabeth Rataj is the lead author. Elisabeth, grew up in Saxony, Germany, where she obtained a Master of Public Health at the University of Dresden. She did the research on the lasting impacts of severe weather while working in Dresden in the Center for Evidence-based Healthcare. Now employed by a large German development agency, Elisabeth is an Advisor at the Department of Education in the Autonomous Region in Muslim Mindanao, in the Philippines. We discuss an article published in September 2016 in the journal BMC Public Health. The title is “Extreme weather events in developing countries and related injuries and mental health disorders – a systematic review“. That’s an open access article, so anyone can read it. We’ve been talking with the lead author Elisabeth Rataj. She did this research at the Dresden in the Center for Evidence-based Healthcare. Elisabeth is now employed by a large German development agency. You can read more about Elisabeth’s research into climate trauma in developing countries in this article in the journal “Open Forest”. Thank you for listening again this week. I’m appealing again for more monthly supporters, or one-time donors to keep the Radio Ecoshock bank account up, and pay the monthly bills. Listeners support free downloads for people all over the world, including our huge back catalog of hundreds of Radio Ecoshock shows. Please consider helping me get these important messages out, especially during the blackening cloud of denial. Get the info here. I don’t get it…. if too many… or ALL nuclear plants melt down… would we even still be here.??? Seems to me… there would be massive deaths and so much radiation in general… within a short while.. everyone would be dying off of radiation poisoning and/or cancer…. How in the world could there be anything left if all the nuclear plants melt down?…. I really need to know this. As we saw during Three Mile Island and Chernobyl, meltdowns do not necessarily mean worldwide collapse.There are scenarios where society would collapse, but the EMP necessary would be catastrophic beyond what we currently understand. A Mass Coronal Ejection, (MCE), would have to be directly in line with the earth’s orbit to have devastating consequences. A Class X would literally strip the earth of it’s atmosphere if we were directly hit, that makes discussion of survival moot. We are never completely out of danger, there are a slew of natural forces that could doom life on the planet; the doomsday notions that are man-made concern me far more than anything we can’t control. Chernobyl was essentially controlled by brave men and women who knew they were dying by capping it off. This is not a cure all, but it worked. Fukushima was built on the coast that is prone to seismic events and their consequences. To say the least, it was a poor choice of areas build a nuclear plant. If you Google nuclear plants, you will notice there are several in California that are built on or in close proximity to major fault lines. If not taken off line, they will prove to be disasters in the future. When the New Madrid Fault slips again, (church bells rang in Boston, the Mississippi ran backward), almost everything within 100 mile radius will be destroyed. It is merely a matter of time. We can only prepare against man-made disasters, we need to be proactive in this, but sadly, we don’t learn from the past. radiation will disperse initially ending up in the food chain. Life expectancy in the 20’s, 30s’ and lots of miscarriages. Radiation will eventually decay to less energetic elements. Meltdown of all nuclear reactors is Dr. Guy McPherson theorized coup de grace to Homo sapiens . His model has been agricultural failure due to Global Warming followed by mass starvation and the loss of capacity to maintain nuclear reactors. Dr. Pry’s is a different initiating event same outcome. Yes, drift2boat… same out come… because OUR FATE WAS SEALED, once we split the atom… and it was on it’s way to being sealed before that… when we began to burn fossil fuel for an industrial society. Thomas Jefferson hated democracy? Anyone with a basic knowledge of history knows that this is false. Mr. Pry is promoting the neoliberal notion of the atomized individual, not dependent on the Government (i. e. “collectivism”). I ask myself: what is Mr. Prys agenda here? Have you asked yourself that question Alex? Be wary! You might find yourself peddling propaganda (fearporn) for the military industrial complex. Thanks again, for sane voices and astute questions. “Starting about two weeks ago I posed to myself that North Korea could easily deliver with one of their smaller rockets, a dirty bomb of radioactive junk left over from their nuclear enrichment program, from a ship offshore of Trump’s Key Largo, or any major American coastal city. “Back in about 1980 I was invited to Air Force Space Command in Colorado Springs where we talked about who notifies who with regard to launches into space. I came away from that meeting realizing it is the third world bad guys we are all worried about the most. Forget ICBM’s, sophisticated miniaturized nuclear warheads. Worry about a third world country barge or ship with a single stage rocket onboard that can loft a 1000 pounds of radioactive hardware to spread over an area of a few square miles. “The EMP threat discussed in the … article is less likely, I think. A few years ago I delivered a talk on EMP and did research on EMP done at various altitudes over the central USA. I’m not sure anyone could do it yet. Most of the EMP stuff built, tested and used today has been cruise missile size stuff. In a modern people against people battlefield a cruise missile EMP using conventional explosives could wife out all radio, radar, etc. electronics in an area 20 or so miles in diameter. “It is not logical to compare satellite EMP to the Carrington event of 1859. The Carrington event lasted hours and the rise of electrical currents gave rise to magnetic changes that induced currents in existing technologies of power lines, railroad telegraph lines etc. The rising cloud of a middle atmosphere nuclear weapon explosion could do the same electro magnetic damage, over a limited area. “We did a number of experiments in my Poker Flat years to document these possible effects. We repaired and brought back to life long electrical communication conductors like the undersea lives to Seattle from Alaska, and the telephone lines along the Alaska Railroad from Fairbanks to Anchorage (that had been abandoned in place and replaced with microwave communication systems). We monitored these lines under a few million dollar contracts for the effects of auroral induced effects over a few years. All events that could be scaled to nuclear weapon events. We looked at slow Carrington events, and postulated EMP events. “EMP kills in two ways. The gamma ray kills electronics instantly. The longer effect is associated with the rising fireball.